Forget about singing in the rain. Ice skating in the rain at Nathan Philips Square is so much cooler! And with the warm, wet weather we’ve been having this winter’s end in Toronto, ice skating through puddles is really the only way to get around our popular outdoor rinks. Popular, at least, when the ice is frozen. 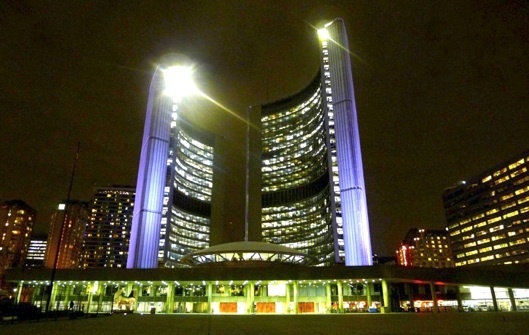 Last night, however, only a handful of skaters laced up their ice skates to enjoy the slick surface at the Nathan Phillips Square rink, which made for a picturesque reflecting pool with Old City Hall in the background and space-agey Toronto City Hall, or New City Hall (below), lighting up the night just steps away. When: Wednesday, March 7, 2012, was the last good skating day of the season. Check the city’s outdoor rinks status page for details on which outdoor rinks are operational till March 11. Caveat: With the Zambonis retired till next year, the ice surface maybe be uneven from melting and refreezing. Cost: FREE if you have your own skates; rentals are closed for the season. Why: With this wonky weather, the rinks are relatively empty, so you can have the rink to yourself for a relaxing night skate to say bye to winter! it’s almost a shame for winter to end and take all of my outdoor skating rinks away from me for another year! beautiful picture of the rink at city hall, though! Ah, true. It’s sad to see the end of skating and skiing season, indeed. But spring also means cycling!!! Woohoo!